What is the product good for? 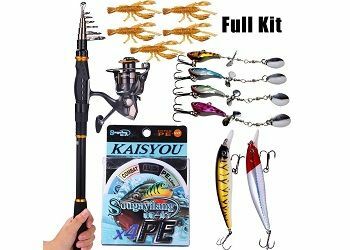 Now, if you want to find yourself a great fishing kit, there are quite a few things that you would have to take into serious consideration. There are a lot of specifications to be accounted for when it comes to it and you would need to have a lot of knowledge in order to make the right call. What is more, there is a tremendous amount of different options on the market and this is going to make your choice even harder as you might end up with the feeling that everything is equally good or equally bad. Furthermore, you need to know that looking for every component individually is likely to end up costing you more, especially if you have no idea about the overall price range of products of the kind. This is the main reason for which we are here to provide you with a convenient option – one which is available as a combo and will provide you with everything you need to begin your fishing undertakings. 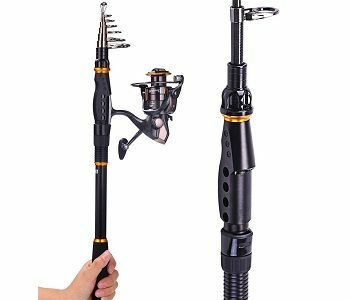 Now, this particular unit is great for a range of different fishing undertakings. As advertised, it is good for both freshwater and seawater adventures, but there are a few things that you need to take into account. The rod is powerful but not as much for you to expect heavy-duty and high-end performance. Apply more pressure on it than it is capable of handling and it is likely to snap on the spot. This rod is an entry-level to mid-level solution at best. Therefore, make sure that the fish you want to go for is of moderately large size and it’s not going to put a lot of a fight. 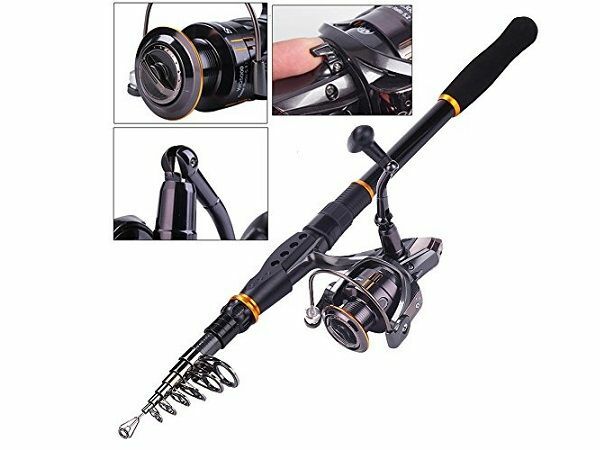 The first thing that you would want to take into account when it comes to getting your overall gear together is the fishing rod. There are a lot of things that could be said about this particular one. It is made out of high-grade carbon fiber. As a matter of fact, the manufacturer claims that 99% of it is made out of this material, which is definitely something that you want to account for. There are colorful guide rings as well as beautiful overall design which is definitely appealing and contemporary. 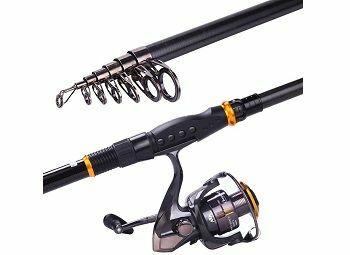 Power – this is one of the most important components that you would have to consider when you are purchasing a rod of any kind. This is a collapsible option which means that some of the power is certainly sacrificed. However, keep in mind that this is not a rod which is going to provide you with high-end and particularly strong performance. It’s designated for milder undertakings and the power is medium. This means that it’s going to bend more than average but it’s sustainable enough to ensure that you have the necessary hardness and durability. Action – medium fast action guarantees flexibility and convenience for both freshwater and saltwater fishing undertakings. You can rest assured that the pole is going to bend from the halfway line onwards and it’s going to recover its original form rather quickly. There are a few important things to consider. The first thing to know is that it’s attached to a full metal reel seat. The gear ratio is 5.5:1 and the cast control is absolutely adjustable. There are rotary switches which are going to allow you to do so. There is an aluminum spool which comes with high-tensile gear. At the same time, you can rest assured that the oscillation system for the line lay is quite excellent. All in all, you can expect convenience, smooth motion and extraordinary bait casting capabilities brought to you by the fishing reel. In any case, this is the perfect kit if you are looking for a semi-advanced travel companion. The fact that the rod collapses to its inconsiderable size means that you can conveniently store it in the back of your trunk or anywhere else. It is a convenient design which is going to enable you to carry it with you wherever you want to. At the same time, this doesn’t mean that the performance is sacrificed. As a matter of fact, it comes with some truly enhanced and extruded pole body, making it reliable and particularly high-performing. All in all, it’s a great option if you are looking for an assembled combo.